The flag of Oregon is currently the only state of the United States to contain different images on the two sides. 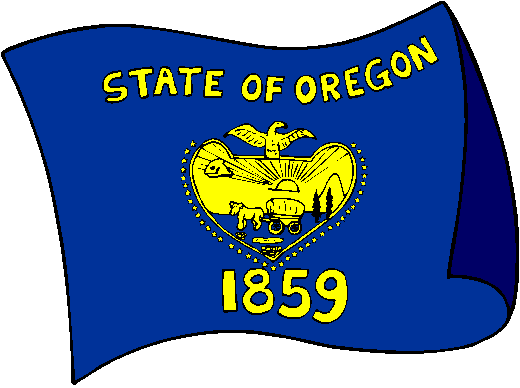 The front ("obverse") depicts the statge seal (supported by thirty three stars representing Oregon's place as 33rd state of the Union) on a blue field. The seal is surrounded by the word "OREGON" (above), and the year "1859" (below), the latter being the year that Oregon was admitted to the Union. The reverse of the flag contains the outline of a beaver (the state animal) on a blue field. 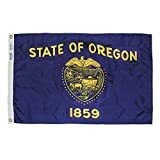 Annin Flagmakers Model 144460 Oregon State Flag 3x5 ft. Nylon SolarGuard Nyl-Glo 100% Made in USA to Official State Design Specifications. The Oregon State Flag is the only state Flag with different designs on each side. The Virginia state Flag has a reverse side to its seal, but it is not seen on any Flag. On the obverse, the central part of the state seal appears. Thirty-three stars representing the number of states in the Union when Oregon won admittance surround a heart-shaped shield. The shield image is of a wagon train arriving at the Pacific Ocean with a rising sun in the background. A scroll bears the state motto ,The Union, and the name and date are above and below the seal. The reverse design shows a beaver on its dam. Both designs are yellow on a blue field. All Annin Flagmakers flags are sewn in either South Boston, VA or Coshocton, OH. Annin's superior quality is time-tested and meets the requirements of the most discerning buyer.